Jeri Lynn Zimmermann (photo ©Commander Idham) – this is her birth name – was born on February 22, 1968 in Munich, in the then West Germany, where her father, an American military, was serving. 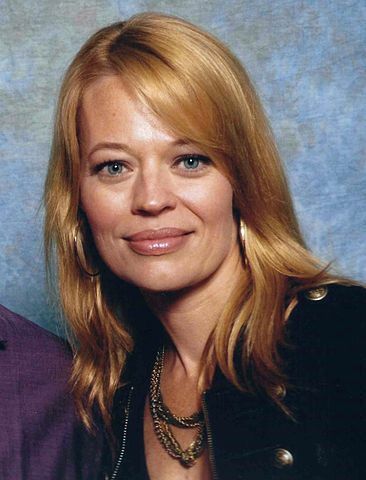 Jeri Ryan studied Theatre at Northwestern University, where she earned a Bachelor of Arts in 1990. At that point, she had already participated in some beauty pageants, was elected Miss Illinois in 1989 and participated in Miss America in 1990. After her graduation, Jeri Ryan moved to Los Angeles, where she started working as an actress. In the same year, she married the investment banker Jack Ryan, hence her surname that she keeps on using. The two of them had a son, Alex. Their marriage lasted until 1999. Since the beginning of her career Jeri Ryan has been above all a television actress, for a few years finding roles in TV films and TV shows and only occasionally in cinema productions. A key role was that in the TV show “Dark Skies”, which lasted only one season still giving her a considerable visibility. In 1997 Jeri Ryan joned the cast of the TV show “Star Trek: Voyager” playing 7of9, a Borg drone who gests disconnected from the collective and must rediscover her individuality. She’s remembered in particular for her very close-fitting costume but in various episodes she also showed her acting skills for which she won the Golden Satellite Award in 1999 and the Saturn Award in 2001 also receiving nominations in other years. 7of9 is her most famous character, to which she also gave her voice in a couple of videogames based on that show. After the end of “Star Trek: Voyager”, Jeri Ryan had important roles in other shows such as “Boston Public” and “Shark”. Among her occasional cinema roles there was also the one in the 2002 movie “The Last Man”. In 2007 Jeri Ryan got married with chef Christophe Émé. In 2008 the two of them had a daughter, Gisele. In recent years, Jeri Ryan has been a guest star on several more TV shows and in 2011 she was cast to play a regular character in the TV show “Body of Proof”, which lasted 3 seasons. In 2016 she played a regular character in the TV show “Bosch”. Jeri Ryan continues her career as an actress but it will be hard for her to find a role that can give her greater fame than 7of9. It’s a role she turned down because she feared she’d become a sort of intergalactic Barbie and the producers had to convince her that her character would be much more. Luckily they did it!